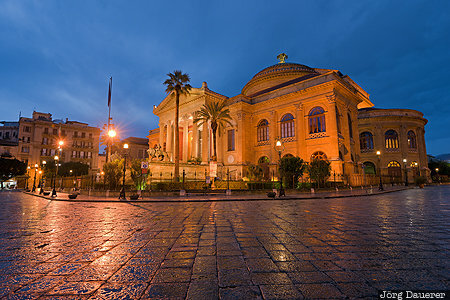 The flood-lit opera house Teatro Massimo in Palermo at the blue hour before sunrise. Palermo is the capital of the Mediterranean island of Sicily, Italy. This photo was taken in the morning of a rainy day in April of 2017. This photo was the image of the month in December of 2017. This photo is in the Photo Calendar "Sizilien". This photo was taken with a digital camera.